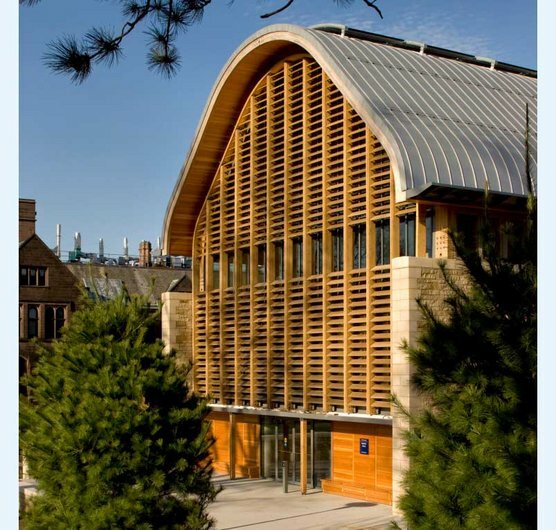 Kroon Hall, the new building for the School of Forestry & Environmental Studies at Yale University has won the AJ100 'Building of the Year' award. The LEED 'Platinum' building is Yale's most sustainable to date, reflecting the School's highest ideals in conservation and sustainability. Judge Angela Brady called it an "outstanding design and exemplar for its sustainability credentials. The curved timber roof structure in the interior is a delight and the detailing looks impeccable. It is warm and welcoming and full of natural light. This addition to the campus must act like a magnet for students wanting to experience UK sustainable architecture at its best."